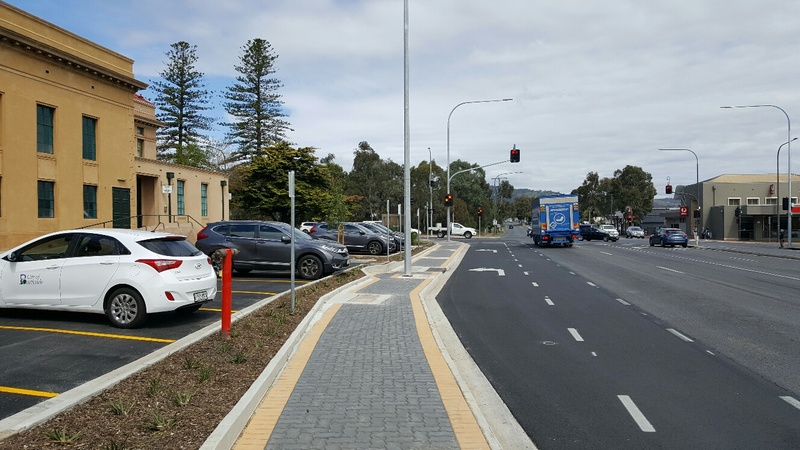 The Department of Planning, Transport and Infrastructure (DPTI) has completed works to improve safety at the Portrush Road intersection with Greenhill Road, Linden Park. Installation of a signalised left turn lane from Greenhill Road into Portrush Road for motorists heading south. Installation of a signalised sheltered left-turn lane from Portrush Road into Greenhill Road for motorists heading east. Reinstatement of landscaping along Portrush Road. Upgrading existing lighting to LED. Installation of an uninterrupted power supply to provide temporary backup power to the intersection in the event of a power outage. These safety improvements will reduce the risk of rear end and left turn crashes, as well as improve the safety and accessibility for pedestrians. The City of Burnside provided their support for the project, by donating part of their land for road reserve. Click here to view a concept plan of the project area. This $420 000 project was jointly funded by the Australian Government’s Black Spot Program and the South Australian Government’s Asset Improvement Program.